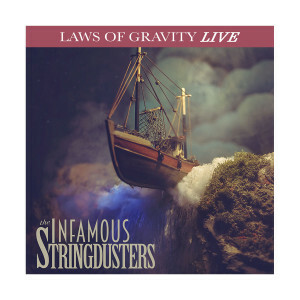 Bluegrass virtuosos THE INFAMOUS STRINGDUSTERS present the release of Laws Of Gravity: Live, a 13-track collection featuring live renditions of songs included on their acclaimed, #1 Billboard Bluegrass album Laws Of Gravity, which was released January 13 on Compass Records. Laws Of Gravity: Live--available digitally this Friday, June 23--was recorded on the road between January and April at various venues along the band’s hectic tour schedule. This new release comes after 52 shows already this year and as the group is in the midst of an extensive touring schedule (see routing below), and arrives just in time for THE INFAMOUS STRINGDUSTERS' June 20 show with Ryan Adams at Denver's famed Red Rocks Amphitheater. In addition to capturing live audio throughout the last tour, the band also filmed and live streamed video of select tour stops for Facebook Live and online archives. Fans at the March 17 show in Chicago were treated to a special performance of “Jessica” by The Allman Brothers Band, and the band recently teamed up with Relix magazine to release this video, which sadly now stands as a tribute to late Gregg Allman who just passed away May 27; watch it here. For Laws Of Gravity: Live, the Grammy-nominated acoustic five-piece--Andy Hall (dobro), Andy Falco (guitar), Chris Pandolfi (banjo), Jeremy Garrett (fiddle) and Travis Book (upright bass)--took production duties into their own hands as Falco and Pandolfi teamed up to produce the record and Falco put the finishing touches on with the mixing process.